Q: What do you get when you cross a world-class stock car racer with marketing financial services? 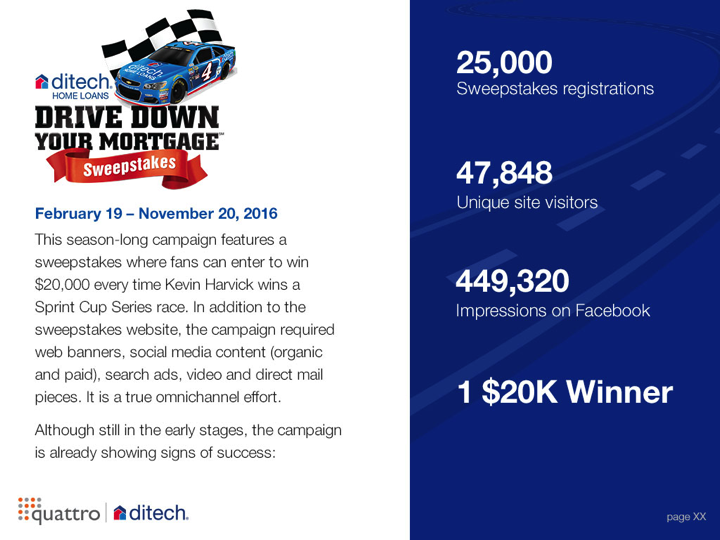 A: No, not the set up for a cheesy one-liner, but the set up for a killer partnership between champion NASCAR driver, Kevin Harvick, and our client, ditech. ditech’s CMO, Rich Smith, and our Managing Partner, Scott Cohen, will be presenting at the Gramercy Forum Philadelphia on May 5th this year to discuss the success of this monumental partnership. When ditech decided to back a champion, we created a plan. 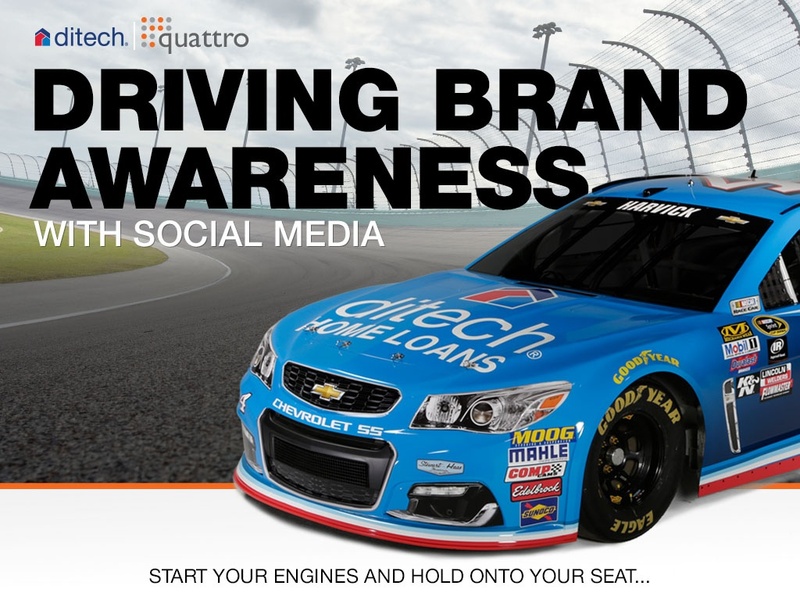 Quattro built an integrated, multi-channel marketing strategy to leverage ditech’s sponsorship with Kevin Harvick in four steps: Build a foundation, establish an audience, grow engagement, then generate leads. To put it lightly, we exceeded expectations. The story begins with an opportunity. Inking a sponsorship with one of NASCAR’s greats opened up a new audience for ditech to reach. Our first step following this deal was social media. There, we built a number of campaigns for ditech’s social channels to cultivate this new audience and build a following. No hesitation. No spend. Total success. Boosting social media engagement starts with understanding your audience. Our Revvin with Kevin campaign demonstrated that by turning the mic over to Kevin’s fans with #AskKevinHarvick. And trust us, the numbers don’t lie. At the end of the day, generating leads is what it’s all about. The Drive Down Your Mortgage Sweepstakes is only partway complete, but it’s already produced amazing success. If anything, take it as a testament to the power of true omnichannel marketing. 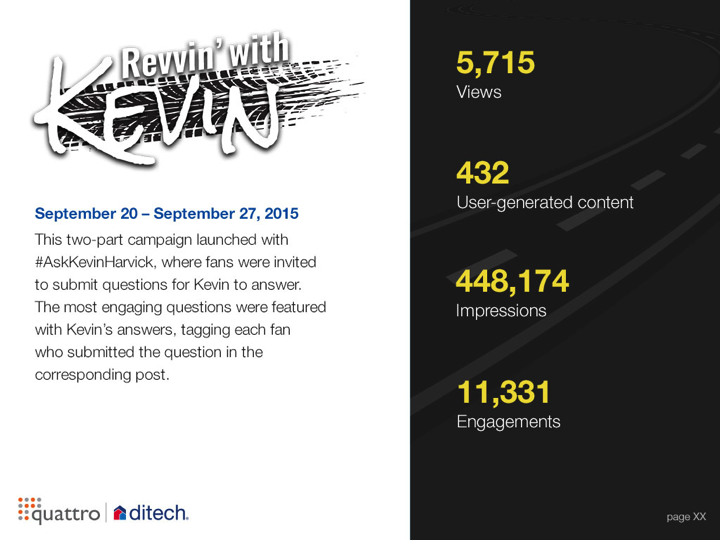 The journey with ditech and Kevin Harvick has gone places we’ve never dreamed of, but it’s far from over. Check out the full case study at the Gramercy Forum Philadelphia. Will we see you there? Tweet us @QuattroPhilly to let us know you’re going.